"Inspired by the dramatic topography of its site, the Hercules monument and water features of the Bergpark Wilhelmshöhe created by the Landgrave Karl of Hesse-Kassel from 1689 combine in an outstanding demonstration of man’s mastery over nature. The monumental display of rushing water from the Octagon crowned by the massive Hercules statue via the Vexing Grotto and Artichoke Basin with their hydro pneumatic acoustic effects, Felsensturz Waterfall and Giant’s Head Basin down the Baroque Cascade to Neptune’s Basin and on towards the crowning glory of the Grand Fountain, a 50 metre high geyser that was the tallest in the world when built in 1767, is focused along an east-west axis terminating in the centre of the city of Kassel. Complemented by the wild Romantic period waterfalls, rapids and cataracts created under Karl’s great-grandson the Elector Wilhelm I of Hesse, as part of the 18th century landscape in the lower part of the Bergpark, the whole composition is an outstanding demonstration of the technical and artistic mastery of water in a designed landscape. Together with the 11.5m high copper sheets Hercules statue towering above the park and visible from many kilometres, which represents an extraordinary sculptural achievement, they are testimony to the wealth and power of the 18th and 19th century European ruling class. ", or so says the UNESCO which made the Bergpark Wilhelmshöhe, Europe's largest hillside park located in Kassel, a World Heritage Site last year. Too bad though that none of the cascades and fountains were running the day I was there earlier this year but it was breathtakingly beautiful and scenic nevertheless. 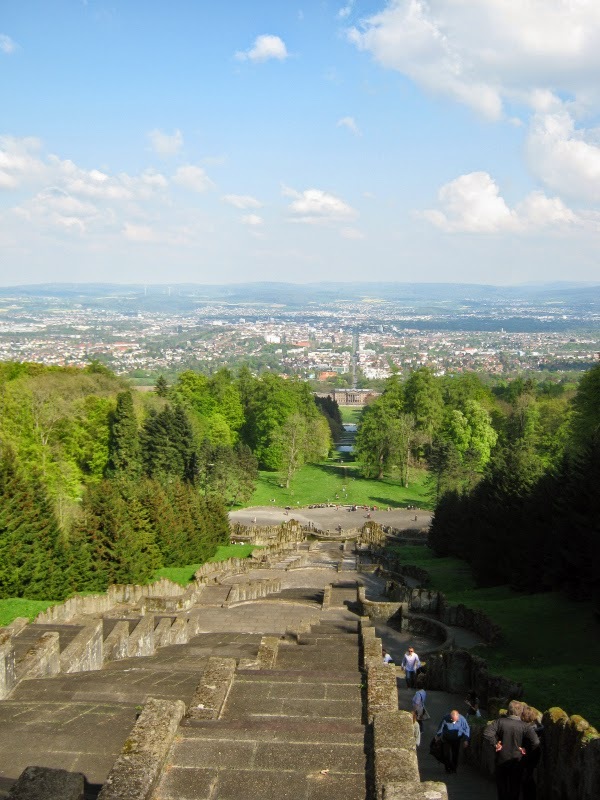 Coming to Kassel, the Bergpark is pretty hard to miss as the Hercules statue literally towers over the whole town and the Wilhelmshöher Allee, Kassel's main street, runs pretty much in a straight stretch from the city centre to the foot of the mountain on which the hillside park is located. Even driving down that road you can already see the park and the hill looked pretty big but little did I realise just how big it is. The first building you will come across when visiting the Bergpark is Schloss Wilhelmshöhe. While it looks rather imposing from the front, the garden side actually makes it look like a nice summer residence. Prior to the castle, the Weißenstein monastery, which was dissolved in the course of the Protestant reformation, was located on the site. Landgrave Philipp I of Hesse used the remaining buildings as a hunting lodge which was largely rebuilt in grander fashion by his descendant Moritz of Hesse-Kassel from 1606 to 1610. At the behest of Elector Wilhelm I, architect Simon Louis du Ry built a new classical castle, which was to be named Wilhelmshöhe, between 1786 to 1798. During his time as King of Westphalia, Jérôme Bonaparte had the Schloss renamed Napoleonshöhe. After the Franco-German War of 1870, the Prussian king sent the defeated Emperor Napoleon III as a prisoner to the castle which had once again become known as Wilhelmshöhe. Between 1899 and 1918, Emperor Wilhelm II used the place as his summer residence. The middle tract of the castle was largely destroyed during the Second World War. The first reconstruction was done between 1968 and 1974 using a functionalist approach. Thus, the castle was rebuilt from the outside but its interior was adapted for the use of an art museum. Even though some changes to the interior were made later on, the castle still houses a museum featuring a Gallery of Old Masters and a Graphic Arts Collection. There are a bunch of other buildings, such as an orangery and a open-air music conservatory, located close to the Schloss. However, the main attractions are situated further up the hill. Opposite the castle lies a lovely pond including the white Apollo Temple (which you can see in the last picture of the post). All throughout the park you will find various man-made waterfalls, cascades, ponds, fountains, bridges, a Roman aqueduct and ruins such as Schloss Löwenburg, which was probably my personal favourite as it looked exactly like a castle I had drawn as a six year old had you asked me to draw a castle. The space where the Bergpark is located now used to be a forested area outside of the city walls of Kassel. As mentioned before, a hunting lodge of the Hesse family had been located where the Schloss stands now for a number of years before work on the actual Bergpark started in 1696 under Landgrave Karl. That year, the construction of a small Hercules statue on a nearby mountain around 400 metres from the famous one started but was later abandoned. The famous Hercules statue located at the top of a Pyramid, which in turn stands on top of the Octagon, was built between between 1701 and 1717 based on the designs of Italian architect Giovanni Francesco Guerniero. To this day it remains the most important Baroque feature of the park. Firstly activated in 1713, the water features are now set in motion on every Wednesday and Sunday between May 1st and October 3rd during the afternoon hours. On special Saturdays, the whole thing is also done at night with special light illuminations. Every time about 350,000 liters of water are needed. The water runs down the cascades, the Steinhöfer's waterfall, the devil's bridge, until it tumbles down the aqueduct before arriving at the lake of the castle where a fountain of about 50 meters is situated. However, those last few structures weren't yet in place during the Baroque era of Landgrave Karl and only a few slight changes were made to the park between the Hercules monument and the hunting lodge during his time. This only changed at the behest of Elector Wilhelm I of Hesse a few decades later. In the meantime, the ideals of landscaping changed from French Baroque to the English garden and keeping those in mind Landgrave Karl's grandson started extensive alteration of the park in 1785. In the course of the extension and modifications, Heinrich Christoph Jussow created constructions which characterise the Bergpark to this day. He built artificial ruins like Schloss Löwenburg, the Roman aqueduct as well as further extensions of the water garden like the Lac, the fountain pond, and the Teufelsbrücke (devils bridge) including the Höllenteich (hells pond). In 1793, Karl Steinhöfer added the Steinhöfer Waterfall to the water garden. In 1806, Kassel became the capital of the newly created Kingdom of Westphalia which was ruled by Napoleon's brother Jérôme Bonaparte. The renamed Napoleonshöhe became his main residence until 1813, the year of Napoleon's defeat. During his seven years in Kassel, Jérôme Bonaparte had extensive renovations and alterations done to Napoleonshöhe. For example, the three seperate wings of the castle were joined together as one big structure. After the defeat of the French, Elector Wilhelm I returned to Kassel and took possession of both Schloss and Bergpark Wilhelmshöhe again. His son Wilhelm II had the last structure of the water works, the great waterfall, built in 1826. Having sided with the Austrians during the Austro-Prussian War, the Electorate of Hesse was annexed by Prussia in 1866. After the Battle of Sedan in 1870, Emperor Napoleon III was sent as a prisoner to Schloss Wilhelmshöhe. 29 years later, the castle became one of the summer residence of the last German Kaiser, Wilhelm II. And so ends the royal history of "possibly the most grandiose combination of landscape and architecture that the Baroque dared anywhere" (or so says art historian Georg Dehio). In 1918, Germany became a republic, the Kaiser was sent into exile and the Schloss and Bergpark Wilhelmshöhe fell into the hands of the state of Hesse who has spent millions over the past few decades to preserve what became a UNESCO World Heritage Site last year. The Bergpark Wilhelmshöhe is admission free and open all year round. As mentioned before, however, the water is only turned on between May 1st and October 3rd on Wednesday and Sunday afternoons. I have been told it's best to simply follow the water so walk (or drive) up to the Hercules statue first and than simply follow its path down the hill. A museum is situated in the Schloss though if you aren't an art lover, it's probably not of great interest to you as it looks rather modern from inside. For more information, have a look here and here.